About half way down the eastern end of Oxford Street, at number 213, above a tiny outlet of Zara, a trio of pretty reliefs commemorate the Festival of Britain of 1951. In the next block down is the imposing black marble art deco Pantheon building, currently housing a medium-sized Marks & Spencer; almost opposite is an ornate Queen Anne-style building, better known as an H&M. If you can see past the crowds, the tourist tack, the endlessly repeating chain stores and the wall of red busses, London’s most-derided street actually has a lot going for it. Moan if you like (you won’t be alone), but then try to imagine London without it. There aren’t many good places to eat on Oxford Street, but Selfridges has 13. You could splash out on oysters and champagne at the Oyster Bar in the Food Court, nip to The Gallery on the 2nd floor for a salad or grab a gelati from the street vendor by the door. 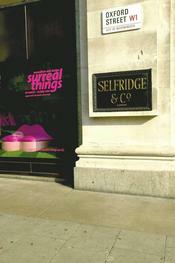 Selfridges, 400 Oxford St, W1A (08708 377 377/http://www.timeout.com/external_link/?http://www.selfridges.com). Bond St tube. Open Mon-Wed 10am-8pm, Thur 10am-9pm, Fri 10am-8pm, Sat 9.30am-8pm, Sun 11.30am-6pm. After 11pm, this dank subterranean den plays host to a number of reliably no-frills alternative club nights. Choose from Tuesday nights’ metal-orientated Beautiful People to Friday’s long-running anthem-heavy indie disco Bedrock. On Wednesdays it’s the more up-to-date I Bet You Look Good On The Dancefloor (which promises at least ten Arctic Monkeys tracks a night). Metro, 19-23 Oxford St, W1D (http://www.timeout.com/external_link/?http://www.blowupmetro.com) Tottenham Court Rd tube. Tickets from Stargreen (020 7734 8932/http://www.timeout.com/external_link/?http://www.stargreen.com). This sartorial Mecca offers more than just a fashion fix. At Hersheson’s Blow Dry Bar you can pick a glamourous style from a choice of seven on their hair menu, each taking less than half an hour and for just £19. To complete the effect, grab yourself a quick manicure at the Nails Inc concession, from £15. 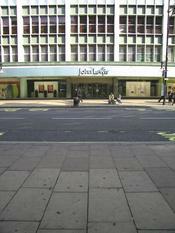 Topshop, 216 Oxford St, W1D (020 7636 7700 /http://www.timeout.com/external_link/?http://www.topshop.co.uk) Oxford Circus tube. Open Mon-Fri 9am-9pm, Sat 9-8.30pm, Sun 11.30am-6pm. The sleek decor and toned staff here are enough to inspire (or possibly shame) anyone into a new fitness regime. Get ready for Wimbledon with a ’50s-inspired tennis dress from the Stella McCartney range , £95. Adidas, 415-418 Oxford St, W1C (020 7493 1886/http://www.timeout.com/external_link/?http://www.adidas.com) Bond St tube. Open Mon, Tues, Wed, Fri, Sat 10am-7pm, Thur 10am-8pm, Sun 12noon-6pm. Whether you want to get ready for a bignight out, freshen up before an important meeting or just get some respite from the crowds, this luxurious, multi-million-pound ladies’ convenience is a handy pit-stop. For £5 you can have a wash, use the impeccably clean toilet facilities, soft white towels and hand creams. WC1, 439-441 Oxford St, WC1 (http://www.timeout.com/external_link/?http://www.wc1.co.uk) Bond St tube. Open Mon-Sat 8am-9pm, Sun 12noon-6pm. £1 for toilets and powder room, £5 with mini-makeover or hand masssages. Virgin has regular appearances from your favourite bands, comedians and movie stars. Previous visitors have included Lily Allen, Razorlight and comic geniuses Noel Fielding and Julian Barratt (from ‘The Mighty Boosh’). Not to be outdone, HMV’s flagship store has boasted gigs lately by The View, The Enemy and Lostprophets. HMV, 300 Oxford St, W1C (0845 602 7802/http://www.timeout.com/external_link/?http://www.hmv.co.uk) Bond St tube. Open Mon-Sat 9am-8.30pm, Sun 12noon-6pm. Virgin Megastore, 14-16 Oxford St, W1D (020 7631 1234/http://www.timeout.com/external_link/?http://www.virginmegastores.co.uk) Tottenham Court Rd tube. Open Mon-Sat 9am-10pm, Sun 12noon-6pm. Literary types and skint students all make use of this second-floor café which permits you to borrow books or magazines from anywhere in the store and browse them at your leisure. Definitely one of the best deals on Oxford Street. Borders, 203-207 Oxford St, W1D (020 7292 1600/http://www.timeout.com/external_link/?http://www.bordersstores.com) Oxford Circus tube. Open Mon-Sat 8am-11pm, Sun 12noon-6pm. Head to this Japanese store for cheap basics that won’t fall apart after one wash. If you hurry, you might find the winter cashmere collections still on sale with V-necked jumpers reduced to about £40. Uniqlo, Plaza Shopping Centre, 188 Oxford St, W1N (020 7734 5369/ http://www.timeout.com/external_link/?http://www.uniqlo.com) Tottenham Court Rd tube. Open Mon-Sat, 10am-8pm, Sun 12 noon-6pm. The new kid on the Oxford Street block is this 70,000 square-foot behemoth of a flagship store which sells the ranges not always found in the other branches, such as homewares and ceramics. Steer well clear during lunchtimes and school holidays. Primark, 499-517 Oxford St, W1K (020 7495 0420/http://www.timeout.com/external_link/?http://www.primark.co.uk) Marble Arch tube. Open Mon-Fri 9am-9pm, Sat 9am-8pm, Sun 12noon-6pm. Ageing ravers might remember Mash from the late ’80s and early ’90s when DJs such as Bryan G would play in-store sets. The scene died away but Mash kept a following from fans of other genres such as hip hop and drum ’n’ bass. Staffed by some of the coolest sales assistants in London , with a banging soundtrack and sale-rail selling clothes you’d actually want to wear, it has a cult following. Mash, 73 Oxford St, W1D (020 7434 9609) Tottenham Court Rd tube. Open Mon, Tues, Wed, Fri, Sat 10am-7pm, Thur 10am-8pm, Sun 11am-6pm. Subscribe to Time Out Weekly newsletter - the best of London in your inbox.